The sun shines on the south shore of Kaua‘i quite unlike any other place on the Garden Isle. From the early morning pink tendrils reaching over Ha‘upu Ridge to mid-day when it seems to creep into even the most reliable shade, to when it sets over the rocky coastline, casting golden flecks over the ocean and fleeting pastels over the sky, the south shore is famous for its warm illumination. 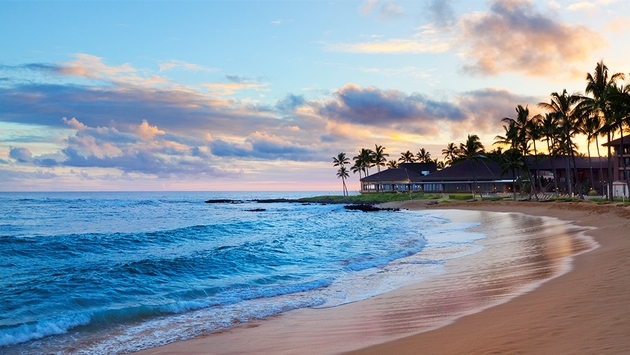 Holding court over this magic coast is the Sheraton Kaua‘i Resort, a fixture for nearly a half-century. 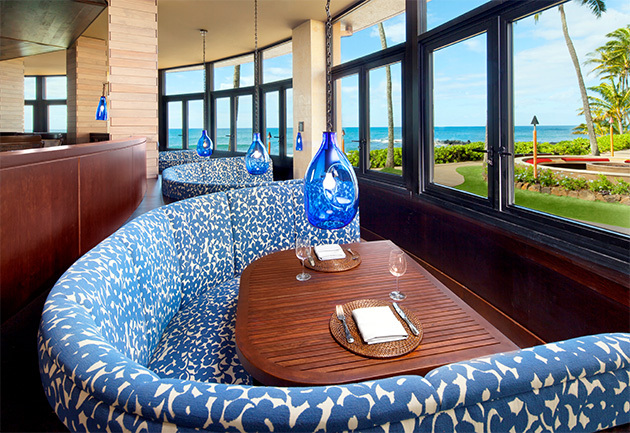 Frequent updates have kept the resort in contemporary condition, the most recent being a room refresh and opening of RumFire Po‘ipu Beach, which boasts spectacular coastline and sunset views in addition to sophisticated culinary innovation. The evening of my visit to RumFire, on recommendation from my friends at Koloa Rum (which also sponsors an annual mixology competition at the restaurant), I tried the Smoke Marinated Rum-Hattan, which is infused with smoke in a mason jar on its way to the table, then poured tableside, a great opener to an unforgettable dinner that included succulent braised short ribs paired with crab-crusted catch of the day (that evening it was opah, a firm-fleshed whitefish with a medium flavor). Individual experiences, of course will vary, but in eavesdropping among the tables, I noticed the amount of interpersonal conversation between servers and diners was remarkable—ordering off the menu felt more like a catch-up with a personal friend, and servers were eager to explain portion sizes and unfamiliar local produce, plus make beverage recommendations. Another great hotel feature is the pool and expansive oceanfront lawn, which gets its best sunlight in the morning hours, when rays are less intense. When they are more intense, there are plenty of umbrellas and shade sails to keep overly ambitious sun worshipers shielded. Guests can use their own mobile phones to order beverages from the bar, and there are beach and pool cabanas available for rental. The smaller garden pooler offers a quieter, more intimate experience. The ocean surf on the beach is relatively strong, particularly during the summer months, so novice swimmers and children would be better off sticking to the pool, but the much calmer surf at Po‘ipu Beach Park is just a short walk away. The beach is a favorite for endangered Hawaiian Monk Seals, which primarily inhabit the islets and atolls to the northwest, but are commonly found hauled out on the beaches of Kaua‘i and Ni‘ihau. It’s a violation of state law to disturb them, whether or not signage has been deployed indicating a protective approach barrier. The hotel does charge a $30 per night resort fee, which includes two bottles of water, daily self-parking, free valet parking for the first night ($10 per vehicle for each additional night, which is not particularly high), internet access, local calls, fitness center access, and daily cultural activities, which include hula lessons, lei making, and lawn games, although these vary on a daily schedule, so guests partaking in shorter stays may not be able to take advantage of their chosen activity if it occurs on a day during they week they’re not in residence. 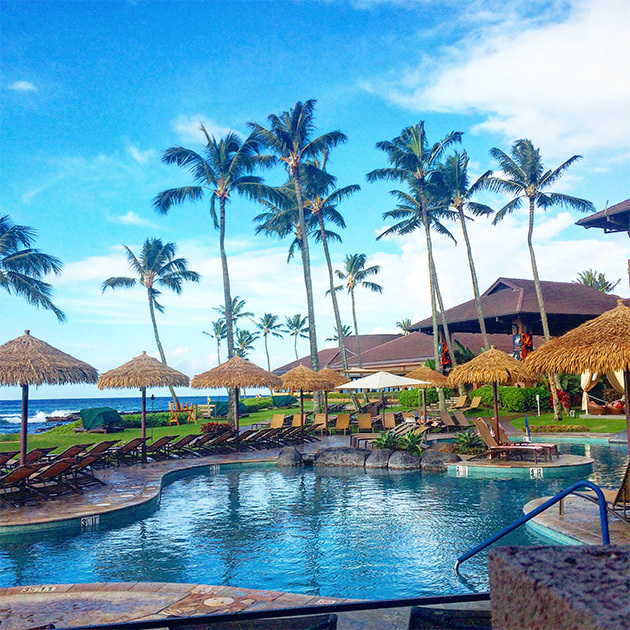 Although the hotel is not itself a timeshare, it’s owned by Starwood’s recently spun-off timeshare unit, Vistana, which operates the fractional ownership Westin Princeville Ocean Resort Villas on the north shore. It’s helpful to know that the company does solicit for timeshare presentations to guests at the Sheraton, so some booked activities may come with strings attached. That said, it’s notable that timeshare presentations throughout the state are typically transparent and low-pressure. The hotel is also well-located in the center of Po‘ipu Beach, close to beaches, shopping, Old Koloa Town, and both the east and west sides of the island. It’s a harder resort to leave, but it’s easy to take comfort in knowing that the resort was one of the first to open in the area and has grown up with the island’s tourism industry. It can be expected that it will remain to sparkle in the south shore’s spectacular light for return visits for years to come. The Takeaway: Comfortable and welcoming, with dependable services and an unbeatable view – this is one of the south side’s best. Rates From: I’ve seen shoulder season rates as low as $170 for garden view and $250 for oceanfront accommodations, before taxes and the resort fee. Instagrammable Moment: Oceanfront rooms are great for those; as are sunrises and sunsets on the ocean lawn. 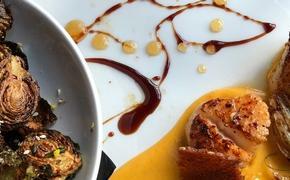 Don’t Miss: A dinner at RumFire – it’s worth it. And there are lighter options for slimmer appetites and budgets. Good to Know: The hotel is not a timeshare property, but sales presentations occur on site. Dinner at RumFire was furnished by the Sheraton Kaua‘i Resort in preparation for this story. Note: Some Hawaiian Language diacritical marks, such as the kahako (macron) have been omitted from this text for web browser compatibility.